Iwaruna.com » I made more cheese. Adding a bit of acid, i.e., vinegar, made a lot more curds form. Really, dramatically more. More than twice as many curds as last time. This cheese was somewhat firmer and more squeaky. I was relieved that it didn’t taste or smell vinegary at all; its flavor was only slightly tarter (less tart than store-bought cottage cheese), yet still milky-sweet. Fresh, unripened cheese, in small curds form. After draining for 10 minutes, I got a roundish, cheesecloth-textured lump of, well, cheese. I decided to mash it up, to effect smaller curds, and make it more spoonable. 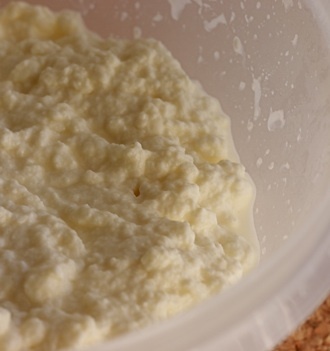 On the surface it looks like cottage cheese, but its texture is much more like ricotta. With a little honey, this makes a yummy snack. I think it might also work as a topping for cereal. I’m sure it’ll be fine in macaroni and cheese. It looks spreadable, too. Hm, I wonder if I could emulate Boursin by adding some herbs and whisking in some cream. Would it convince my Boursin-loving friends? Mixed the whole milk and buttermilk in a non-reactive, heavy-bottomed stock pot. I let this sit overnight at room temperature. I might skip this step in the future, since I didn’t notice any curds or other changes appearance or smell. Popped a thermometer into the pan, and put over a medium flame. Waited ’till temperature reaches 175F degrees. While heating, restrained self from stirring…erm, I did so twice: First, at the beginning to break up the cream that had floated to the top from non-homogenized milk sitting overnight. Second, when I heard a gurgling noise as it approached the target temperature (thankfully, no burning, and the stirring quieted things). While heating, busied self by lining a strainer with 4 to 6 layers of cheesecloth. Set it over a large bowl (in the sink would work, too). Turned off the heat when 175F was reached. I lied, and for the third time I stirred; actually, scraped the floor of the pan with a spatula to loosen any sticky curds. There were (still only) a few curds floating about at this point. Stirred in the vinegar. FWOOMPF. More curds materialized! The liquid went from milky white to a clearer pale yellow. Do not fear this color. Scooped the curds into the lined strainer. Hastened the draining somewhat by pulling upwards at the edges of the cheesecloth, but really, I could’ve just let it sit for about 10 to 20 minutes (or more for a firmer cheese). I then added a shake of salt, and stirred as I transferred it to a bowl. Yielded about 2 1/2 to 3 cups. This was written by sairuh. Posted on Wednesday, January 30, 2008, at 4:45 pm. Filed under Food. Tagged cheese, hacking, recipe. Bookmark the permalink. Follow comments here with the RSS feed. Post a comment or leave a trackback. Wow, this is the first post we’ve seen in cheese making! We have made our own ricotta. We like the firmness that you talked about here. We’ll definitely try it soon. Thanks!